Prada's product line has different luxury fashion articles, such as men's and women's clothing, shoes, handbags, skin care, perfume line and other products. Prada started as a small leather handbags and luggage company in Milan (1913) and has grown into large billion dollar company. Prada handbags have always been coveted pieces of accessories and Prada has retained its place in fashion handbag world since its beginning. Prada men's bags selection has messenger bags for men, Prada luggage and trunks, tote handbags for men and gym handbags or the so called carryalls and weekenders. The brand's messengers are usually made of leather or canvas. The most recent canvas messenger line features military theme and camouflage fabric is used. 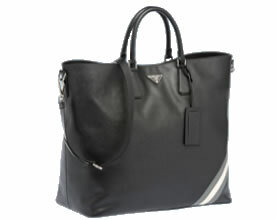 Prada messenger bag price range from 500 USD per canvas messenger to 1500 USD per luxury leather messenger bags. Prada men's handbag range is quite sufficient and right now there are no any standouts, although according to their sales records, these handbags and carryalls are among the top designer handbags for the male customers. The company is working hard to revamp the bag line and let's hope to see the results soon. This is the brand that offers very military and masculine handbags and at the same time their male section has a crimson tote to offer. 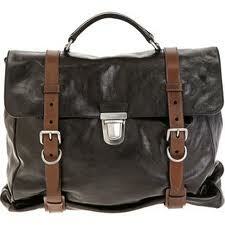 However their general style is masculinity and clean lines. For example, this tote (picture to tthe right) in leather has military inspired design, it is made in soft leather, has double handles and the shoulder strap is removable. The size for this handbag is 16.9" x 15.7" x 8.2". Online price is $ 1,750. Prada gym bags and men's totes have more sparkle to them, as the military, skull and tattoo themes gives a trendy look for these men's totes. These totes are also available in fabric and in leather. Prada business bags and briefcases are classic, simple and elegant and you can also buy laptop bags and document holders that have good quality, although the price is bit high. But it is still reasonable if compared to other design houses offering similar products.